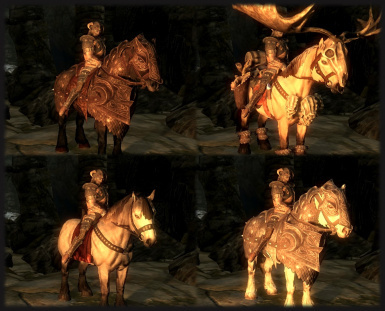 I'm using Immersive Horses and the patch uploaded in the files' section. -Aeonbarr doesn't respect the follow command from IH, standing still when I dismount and go away. -I once spotted him disappear and reappear a little further. 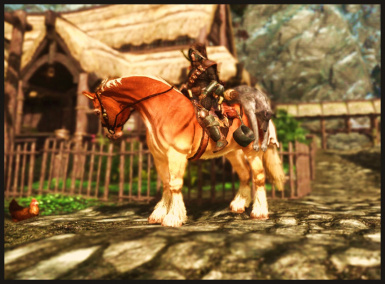 -IH listed him as "borrowed" (couldn't find anywhere what that means, but it did the same thing with other modded horses) and I can't adopt him no matter how long I mount him. Still I can see his stats and access my herd; obviously no inventory. -The hotkey fails to work, idem the power, so if I need him I have to find him first. A work around is probably to prid him. -MCM is working as intended, so no complain. 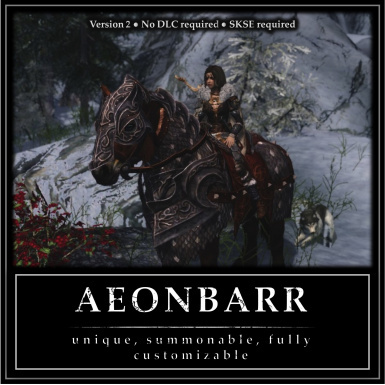 I used Aeonbarr A LOT in my previous playthrough with CH, he was my favourite horse and never had a issue. I'm certain the problems come from the patch and from my heavy load order, just wanted to post my experience. Used with Convenient Horses this horse is the best. PS: Yes, I put the patch after both mods. 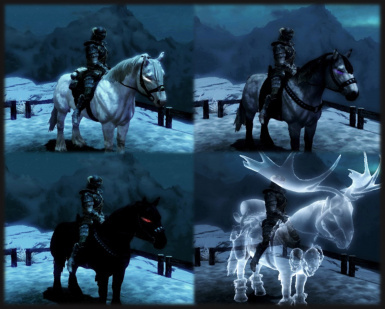 Love the options for customizing all the colors and eye options, all I'd really want in a horse. Could you add a disease resist option in the menu to complete the set of defense. 1. The horse will warp back to the last fast travel spot used after a few seconds when you dismount. the most recent fast travel as his spawn as any horse. 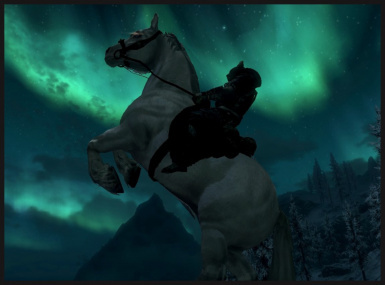 you will see him warp back to whiterun stables. This applies to any location fast traveled to caves,ruins,towns etc. looks. Seems to happen over time in general as well. Using the moveto player console command on the horse can be a workaround for now. Would a one way spell work better since the console command seems to function just fine. rock sprites.You are able to walk through them, they are just visible. Some others said it happened in nordic ruins too. Didn't see it happen in other town's buildings so far just Falkreath. to count that as floor 2. Seems like it puts the floating rocks on floor #2 from bottom up whichever way it makes that count by cellar/surface or ground/attic. Dengeir of Stuhns house is spared of floating rocks since he doesn't have a 2nd floor it seems. 4.At which point they summoned the >might< seed, think you were going for mighty not might. 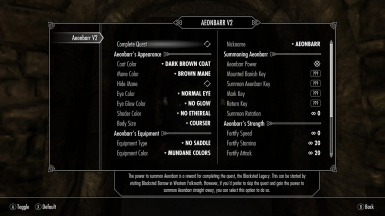 5.Hide mane menu option, >Aonbarr< Aonbarr is a typo of Aeonbarr. 6.Equipment color option, you must adjust the >seetings< to give; seetings is typo of settings. 7.Magic resistance option, including spells,dragon >breathe< and weapon enchantments. Think you meant to type breath not breathe. The horse functions great riding around. Just the few bug issues I listed to be resolved if you ever have time to fix them, and the mod is perfect. Hmm, I've been having an issue where if I try to complete the questline, the menu for Aeonbarr will be completely blank (nothing is on it at all). The issue was encountered when the lift leading to the final fight started to loop me up and down (like the Alftand Lift bug), and when I went to the menu to cancel the quest, there was nothing there. I tried to go to an older save and complete the quest through the menu but when I did, it still went blank and there wasn't any summoning spell either. 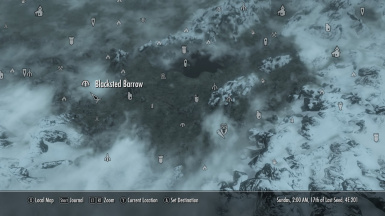 In addition, when I went to Falkreath early (I lost like 3 hours of gameplay because I didn't save correctly hgfdhfhng) to get ready and reinstall the mod, trying to open up that new save file with the mod reinstalled resulted in a corrupt save. Don't know what the issue is, no matter what save I use and how old it is, the menu still becomes blank. I absolutely adore this mod, and I'm heartbroken that I'm going to have to start a new playthrough without it on sse. I don't know how to port mods over, so I'm curious if there's going to be a port of it now that skse 64 has officially released. Does anyone know if the mod author has any plans to do so? Didn't find any of the notes from the description and I have the Unread Books Glowing mod. I had a bug happen to me just a minute ago. I summoned Aeonbarr with the power rode him for about 12 seconds, got off of him, and couldn't get back on. It would not give me the option to get on him. I tried uninstalling CH because it happened after CH was loaded in the game, but that didn't help. I also tried using the spell instead but it still won't let me get on Aeonbarr. If you could try and help with this issue it would be very much appreciated. I have the same issue (except I never used CH). Been looking for a fix for a while now. EDIT: Disabling AFT fixed it for me! I've fallen into the same trap. I have the latest Aeon download, use Convenient Horses. I rode Aeonbarr on set up and all was OK - what a horse! Fantastic! But now I have no way of riding Aeonbarr. Click on him and nothing appears. I tried disable/enable and reset ai. Nothing. Refresh game, change his size., colour and shape, nothing. I do have Immersive AFT but don't want to drop that mod for Aeonbarr. I tried deselecting it in my load order, and also changing the load order around the mod, but with no success. I hope there's an easy solution! I'll have a rummage and see what turns up. If I have luck I'll let you know. Oh - I cured him! I changed his name in the Aeonbarr MCM Menu "Nickname" box and the Ride command re-appeared. I didn't expect it to be that easy! How do you change the mod nickname? I've been having this same issue with Aeonbarr and really hope this will resolve it! 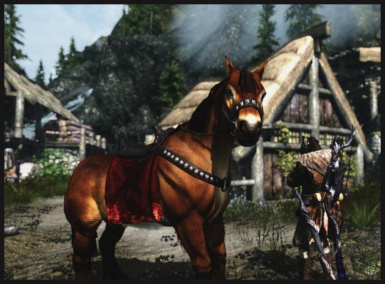 Is there a way to get my favorite horse to work on special edition?